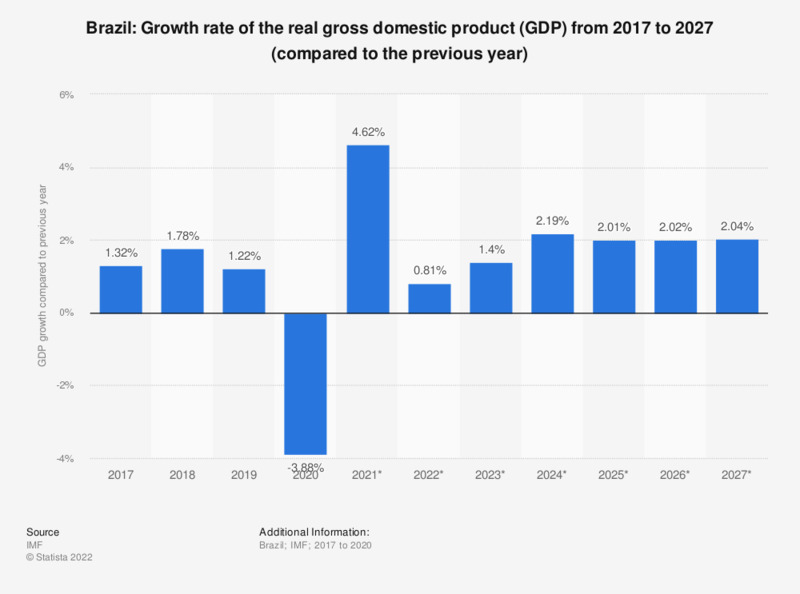 The statistic shows the growth in real GDP in Brazil from between 2014 and 2018, with projections up until 2024. In 2018, Brazil’s real gross domestic product increased by 1.11 percent compared to the previous year. GDP is a reliable tool used to indicate the shape of a national economy. It is one of the most well-known and well-understood measurements of the state of a country. Gross domestic product, or GDP, is the total market value of all final services and goods that have been produced in a country within a given period of time, usually a year. Brazil has undergone a huge economic transformation in the course of the last decade and is now one of the fastest growing economies on the planet. It belongs to the BRIC club of countries, an acronym that refers to the countries Brazil, Russia, India and China, a group of countries which are considered to be at a relatively similar stage of new and advancing economic development. Economic reforms in Brazil have given the country a boost on the international stage, which has helped it to gain significantly in recognition and influence around the world. The domestic product growth rate in Brazil is progressing throughout the years. After a minor blip in 2009, when a short recession saw the rate of growth moving slightly backwards, the economy has picked itself up and fought back with an increase of an impressive 7.53 percent in 2010. Despite the rapid growth and the perceived increase in Brazilian domestic prosperity, the gap between rich and poor remains distinct. The lower class manifested themselves in the numerous protests that erupted across the South American state in the summer of 2013. For days, hundreds of thousands of Brazilians took to the streets to protest the increase of public transport fares, but the demonstrations evolved into a more general protest against increasing social inequalities among the Brazilian population, despite increased prosperity.